NASA is heading back to the ocean floor twice in the next three months to test out techniques and technologies that could improve astronauts' lives in orbit and help them explore an asteroid down the road. Teams of "aquanauts" will live and work at a research facility 62 feet (19 meters) beneath the waves off the coast of Florida in two missions staged by the NASA Extreme Environment Mission Operations program, or NEEMO. 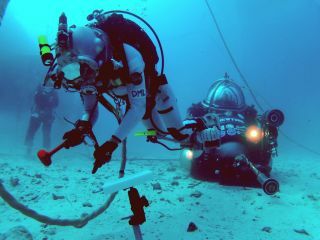 The first of the two stints, known as NEEMO 18, starts on July 21 and lasts for nine days. The seven-day NEEMO 19 mission begins on Sept. 7. "It is both challenging and exciting for our astronaut crews to participate in these undersea missions in preparation for spaceflight," Bill Todd, NEEMO project manager at NASA's Johnson Space Center in Houston, said in a statement. "It is critical that we perform science applicable to NASA’s exploration goals in a high-fidelity space operational context," he added. "The extreme environment of life undersea is as close to being in space as possible." Both missions will also include extravehicular activities (EVAs), simulated spacewalks that send the aquanauts out into the ocean for a variety of purposes. "These EVAs will focus on evaluating man-machine work systems and EVA tools and techniques for exploration tasks in varying levels of gravity ranging from that of asteroids to the gravity of Martian moons and Mars itself," NASA officials wrote in a description of the upcoming missions. Both NEEMO 18 and NEEMO 19 will be based at Florida International University’s Aquarius Reef Base, which lies 6.2 miles (10 kilometers) off the coast of Key Largo, Florida. Japanese astronaut Akihiko Hoshide will command NEEMO 18, which also includes NASA astronauts Jeanette Epps and Mark Vande Hei and ESA astronaut Thomas Pesquet. NEEMO 19 will be led by NASA astronaut Randy Bresnik. Other crewmembers are Canadian Space Agency astronaut Jeremy Hansen, ESA astronaut Andreas Mogensen and Herve Stevenin, ESA’s head of extravehicular activity training at the European Astronaut Center in Cologne, Germany.